Stuffing is an absolutely delicious side dish to serve along with turkey or chicken. While the bread-based mixture is traditionally stuffed inside of the bird you’re cooking, most food safety experts recommend cooking it outside the bird to ensure that it gets hot enough and doesn’t harbor any raw poultry juices inside. I’ve always made stuffing – or dressing, if you prefer – in a casserole dish because I enjoy the crispy top that it gets when it bakes that way, but the presentation for stuffing always leaves a bit to be desired. 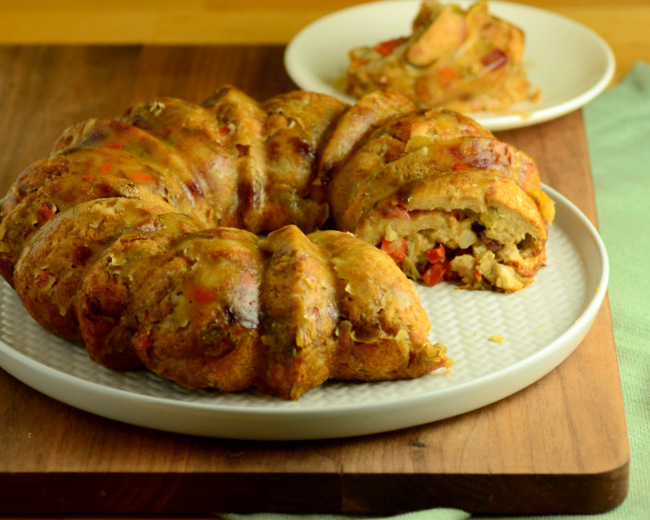 This year, I decided to explore some new ways to show off a stuffing so that it looks as good as it tastes when it gets to the table, like baking it in a bundt pan! This Bundt Pan Stuffing is made using my basic Vegetarian Stuffing recipe, one of my easiest and most-made recipes, but you can make it with any stuffing recipe that you like. If your recipe fills up a 9×13-inch pan to the top, it is enough to fill a bundt pan. If it is less than that, you’ll need to double the recipe for the best results. The bundt pan needs to be well-greased to prevent sticking before the stuffing mixture is transferred into it. It will settle as it bakes, so there is no need to pack it down too aggressively. The moisture in the stuffing comes from the addition of turkey or chicken stock in most recipes and that liquid is what will help the stuffing hold its shape in the pan. It should bake until it is crisp on top and set around the sides. If your recipe is especially moist, you may see a few bubbles on top as the stock turns to steam in the oven! Allow the stuffing to cool slightly before turning it out of the pan to help it hold that shape. About 20 minutes of cooling time should be enough to let the stuffing release easily, while still being hot and delicious in the center. Use a serrated knife to slice the stuffing into individual portions to serve. Preheat the oven to 350F and grease a bundt pan well. In a large frying pan, sautee the onion, celery and carrots in butter until tender, then add in the diced apple, parsley, sage, salt, pepper and cayenne pepper and cook for 2-3 more minutes. Remove from heat. In a large bowl, combine the bread cubes with onion mixture, cranberries, pecans, stock, adding slightly more if the bread is very absorbent (some need more liquids), and mix well. Taste one of the cubes and, if necessary, add additional salt or pepper. Pour into prepared bundt pan. Bake for 30 minutes. Remove foil and bake for an additional 30 minutes, until top is crisp and golden. Allow stuffing to cool in the pan for 15-20 minutes, then invert onto a serving platter and serve warm. What a great idea! My vegan family loves stuffing/dressing and I just love this way of making it a bit fancier! Thanks for sharing!